The Oxford Tradition is an academic program for students in grades 10-12 held in Pembroke and Corpus Christi Colleges, Oxford University, England. There are approximately thirty courses available, as diverse as Archaeology, British History, Medical Science, Law and Society, and Journalism. Our courses immerse students in subjects about which they are passionate while helping them uncover the spectacular sites and cultures in which they are living. The Oxford Tradition is an academic program for students in grades 10-12 held in Pembroke and Corpus Christi Colleges, Oxford University, England. There are around thirty courses available, as diverse as Archaeology, British History, Medical Science, Law and Society, and Journalism. The international faculty includes Rhodes and Marshall Scholars, as well as creative professionals – actors, artists, photographers, filmmakers, and writers – from London and elsewhere. Together with program administrators, including Program Deans and Activities Directors, students enjoy a daily schedule that combines intellectual and curricular adventure, cultural enrichment, guest speakers, field trips, activities and sports – all in a safe, supervised environment. With our programs in the UK, admissions representatives from different institutions attend, including staff from Cambridge and Oxford Universities; Rhodes and Gates Scholars discuss graduate life and how to win scholarships and fellowships supporting university study abroad; and local undergraduates demystify the application and interview process. Students learn a great deal about the world of opportunity awaiting them at the undergraduate level and beyond in Cambridge, Oxford, and elsewhere. At the end of the program, students have the opportunity to spend 6 nights in Paris to complement their time in Oxford: see The Paris Connection. For students in grades 8-9, please view our Oxford Prep Experience. 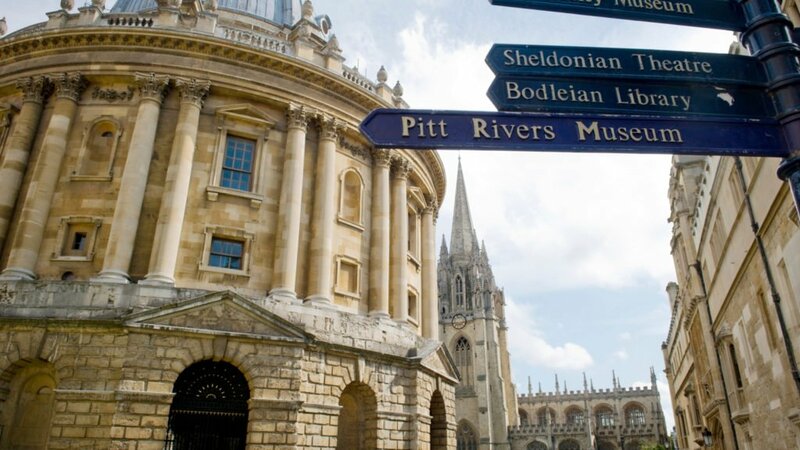 The Oxford Tradition is sponsored by The Foundation for International Education in cooperation with Oxbridge Academic Programs and accredited by the Accreditation Service for International Colleges. Our students choose any two courses on the following pages, one as a MAJOR course and one as a MINOR (WORKSHOP in New York, at UCLA and at Harvard). Major courses meet six mornings a week and, depending on the course, include in-class time for fieldwork, labs, workshops, guest speakers, group discussions, and one-on-one instruction. They also include homework and require project and preparation time outside of class. Minor courses meet three afternoons a week, with no homework and all work contained within the class session. A Minor course offers a sample of a different subject than the Major and most students find their Minor a welcome opportunity to try a new subject for the first time. There is no final application deadline. We accept applications on a rolling basis until a program is full, but we do have Course Guarantee Deadlines. Students who apply on or before these dates and are accepted to the program have their first choice of courses guaranteed, subject to enrollment minima. These dates are not final application deadlines. Archeology: Students become historical detectives as they reconstitute the daily lives of ancient civilizations through a mixture of labwork, investigating artifacts in museums such as the Pitt Rivers, and visits to local digs. They learn how to read evidence and design their own research projects, even exploring how an archeologist of the future might view us. CSI Oxford: Students discover how – from toxicology and fingerprints to DNA samples – Forensic Science has progressed over the past 150 years to meet ever-changing legal standards. They learn how modern crime scenes are secured and searched, how material is treated in laboratories, and how different types of evidence are used to sort legal fact from criminal fiction. Branching out, they discover how Forensic Science has achieved breakthroughs in a multitude of disciplines, such as archeology, history, and geology. Politics & Economics: Oxford’s famous undergraduate degree, Politics, Philosophy, and Economics (PPE), is adapted for our students. They examine the institutions and policies of modern Britain and contrast the British, American, European, and East Asian approaches to global problems. Students engage in practical exercises such as a fantasy stock portfolio competition and complete their month by participating in a mock Parliament. Speech & Debate: Students explore major debating styles and strategies, engage in daily speaking exercises, orations, and dialogues, and prepare and present regular debates. The culmination of the course is a formal debate in the historic debating chamber of The Oxford Union Society, one of the oldest university debating societies in the world, founded in 1823. A journalist, screenwriter, filmmaker and author, Michael has a great deal of experience on our programs, having taught on the Oxford Tradition before directing the Cambridge Tradition for ten years. He now returns to the Oxford Tradition for his seventh year as Director. Since graduating from the University of British Columbia with a BA and from Oxford University with an MLitt, Michael has written widely for major publications and for TV in the UK, the US, and Canada, winning two national awards for feature writing. He co-wrote and produced Sacred Ballot, a documentary for CNN and the CBC on the successor to Pope John II, and three widely acclaimed documentaries for CNN, The Mystery of Jesus, The Two Marys and After Jesus. His first novel, The Penalty Killing, won outstanding reviews when it was printed in paperback in 2011. His book, Hockey Night in Canada: 60 Seasons, was published by Penguin in October 2012. Our academic faculty is specially chosen from teachers and researchers in some of the world’s leading universities. In 2015 our teaching staff in Oxford and Cambridge alone consisted of more than 28 Rhodes, Gates, Marshall, and Fulbright Scholars, making Oxbridge one of the biggest employers of Rhodes Scholars in the world. Syed is currently carrying out doctoral studies at the University of Oxford as part of a machine learning research group. He has particular expertise in financial timeseries forecasting and volatility prediction. In addition to a Rhodes Scholarship, he also holds an Oxford-Man Institute of Quantitative Finance Scholarship, and won a Gold Medal for securing the highest GPA in his year group in the University of Sciences and Technology in Pakistan. Outside academia, he has worked in training, development, and instrumentation and controls for Engro Fertilizers Ltd. He was also selected to be a Microsoft Student Partner. Flora is a journalist specializing in international news and current affairs. She currently works in Thailand, reporting for the Christian Science Monitor and The Sunday Times. She also produces films for Channel 4 News, one of Britain’s leading daily news shows. Before moving to Thailand, Flora reported from Kenya, the United States, and China. In 2009 she was shortlisted for the Young Journalist of the Year at the British Press Awards. A Rhodes Scholar, Donald is researching modern British and European history. He has a particular interest in the works of Ralph Ellison. In past years he has held research scholarships at Stanford University and the University of Iowa. Donald has addressed a variety of unions and organizations as a keynote speaker in both Europe and the United States. Rodrigo is a doctoral researcher in International Relations at the University of Oxford. He has a particular interest in transnational civil society and arms control policies. He is a decorated scholar and was awarded a prize for his master’s dissertation by the Ministry of Defense in Brazil. In the past he has worked for the Institute for Applied Economic Research, a Brazilian government-led think-tank, whose main mission is to improve the country’s public policies through research activities. Rodrigo served in the Brazilian Army as a First Lieutenant. He has published widely and is routinely cited as an authority on civil and social issues in the South American press. Once the seat of kings, Oxford has been a scholarly community for almost 900 years. Today it continues to be one of the most important intellectual and cultural centers in the world. Founded long before the first millennium, Oxford had acquired a reputation as a gathering place for scholars by the time of the Norman Conquest in 1066. The first Oxford college was founded in the mid-1200s and today the University enrolls over 20,000 students in 38 colleges. Oxford and its University have nurtured many famous figures who have shaped English culture and society, including no fewer than 12 saints (before the Reformation) and 24 Prime Ministers, most recently Margaret Thatcher, Tony Blair, and the current Prime Minister, David Cameron. The University has bred great writers and thinkers like Adam Smith, John Locke, Percy Bysshe Shelley, J.R.R. Tolkien, W.H. Auden, C.S. Lewis, and Oscar Wilde, as well as renowned scientists such as Edmond Halley, Robert Boyle, Stephen Hawking, and Tim Berners-Lee, the inventor of the World Wide Web. Designed to complement students’ class work, the cultural enrichment program ensures that whenever students are not in the classroom they have a range of cultural opportunities available. From museum tours to choral concerts, students have multiple options every day to satisfy their creative and intellectual ambitions. The Activities Directors transform Oxford into a living classroom where students can actively – and safely – engage with the history and tradition around them. There are also many historical sites in Oxford that mark pivotal events in British history from early times to the present day. Every college is a fascinating chapter in the story of the University and provides a glimpse into hundreds of years of intellectual endeavor and academic tradition. From discovering Oxford’s extraordinary Pitt Rivers Museum to following in C.S. Lewis’s footsteps, students have almost unlimited opportunities to be out and about. One might find them browsing an antiquarian bookshop, Blackwells bookshop, visiting an exhibition at the famous Ashmolean Museum, watching a play outside Oxford’s medieval castle, picnicking in the Parks, or simply watching the world go by in a local café. Our extracurricular program maintains a healthy balance between study and leisure time that allows students to relax and unwind. The Activities Directors organize daily elective social events and sports. These typically include punting on the Cherwell or Thames, dances, hikes, soccer, tennis, quidditch, cricket, running – students might run a lap on the track where Roger Bannister broke the four-minute-mile barrier in 1954 – chess tournaments and quiz nights, as well as plenty of time for fun, relaxation, sightseeing, and socializing with new friends. All of these activities provide our students with unparalleled exposure to Oxford’s many resources. In addition, they help students make friends and discover shared interests that settle them swiftly into their new surroundings. This level of familiarity and bonding helps create the warm, welcoming community within each program. The Residence: Pembroke and Corpus Christi Colleges are located in the ancient heart of Oxford and are home to The Oxford Tradition. Founded in 1517 by Richard Fox, then Bishop of Winchester, Corpus Christi College boasts an elaborate sundial, built in 1581, that still stands today. Pembroke College was founded in 1624 by King James I. Former members include British Prime Minister William Pitt the Younger, American Senator J. William Fulbright, and Samuel Johnson, author of The Dictionary of the English Language. Staff & Supervision: All our programs have central offices open daily from breakfast until midnight where students can seek advice and answers to their questions. The Program Director and residential staff members live in the same residence as the students, ensuring availability and care around the clock. In addition, the college gates are manned by a staff of College Porters who are on duty 24 hours a day and always available in case of emergency. Accommodation: Our students and faculty live in the same rooms and in the same style as undergraduate students. While historic buildings bring ambiance and tradition, they may also mean adapting to a different style of living. Each student resides in a single or double room on a traditional ‘staircase’. Each room is furnished with a bed with linens, a dresser or wardrobe, and a desk and chair. Every day a college employee, called a ‘scout’ in Oxford, tidies the student’s room and makes the bed. Meals: Students enjoy a cafeteria-style breakfast and dinner in a college dining hall. Throughout the month special dinners are held, including outdoor barbecues and themed feasts, and each program ends with a formal banquet. Students are responsible for their own lunches. These can be purchased at a college snack bar or at any of the many sandwich shops, small restaurants, and coffeehouses near each college. College Facilities: Beyond the classrooms and dining hall, students have the use of a Common Room for socializing and watching television or movies. There are nearby public telephones and onsite message boards and students collect their mail daily from the Program Office. Every student is met personally at the airport immediately upon arrival and escorted back to the residence. At the end of the program students are accompanied to the airport where our staff oversees check-in and departure. A representative stays at the airport until all the flights have departed. Our programs take place in secure residences, situated in safe neighborhoods, with controlled access and 24hr security. Day-to-day life is overseen by teams of Deans – professional educators drawn from leading schools in the US and Canada. Each program has an office, in a central location, which is open and permanently staffed by Deans from before 8am until well past midnight, where students and their parents can seek advice or assistance. Every student checks in personally, every evening, with the Deans on duty. The Program Director, Deans, residential staff, and some members of faculty live in the residences, ensuring round-the-clock care and supervision. The rules about exploring the cities vary from program to program. Generally speaking, students are free to discover the surrounding neighborhoods in small groups without adult supervision during the day and, in the older programs, in the evening. At other times staff is available to accompany students and help ensure that the venues are both welcoming and safe. On the Oxford and Cambridge Prep programs, all students must check in with a Dean between 9 and 10pm. Program staff then perform bedroom checks at lights-out, which is at 11pm. On the other programs, students check in with the Deans between 10 and 11pm. Thereafter they can make use of the common areas, watch movies, or socialize quietly until midnight, when they are expected to be in their own rooms and quiet. Students accepted into our programs must sign an agreement not to purchase, possess or consume alcohol or drugs or associate with any student who does. Any student found in violation of this policy will immediately be expelled and sent home at the family’s expense. Thank you for your interest in our WorldStrides The Oxford Tradition Tour! Please tell us a little more about yourself so we can get you sent to the right place.